A response by Ukrainian troops to possible provocations from Russian-backed fights will be tough, Commander of the Joint Forces Serhiy Nayev has said. 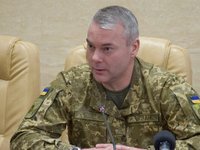 "One of the main tasks for me as commander is to stop unpunished attacks on Ukrainian positions, which causes the death of our soldiers. The answer to such provocations will be tough and inescapable," he said at a briefing in Kramatorsk on Wednesday. Nayev also noted that the implementation of the Minsk peace agreements on Donbas does not deprive the joint forces of the right to defend themselves and react to enemy attacks by using all available means. According to him, military activities will be accompanied by the testing and further implementation of the latest automated troop command and control systems.